My collage's theme was based on the 50's-70's. I wanted to incorporate black and white elements because TVs were still black and white up until 1967 and then I included tie-dye because of the 70's. Newspaper was a common thing back in this time period and so were VW bugs. The Beatles, Elvis Presley, and Marilyn Monroe were all popular stars and were partially what this time period was known for. To stick the newspaper to the paper I put gel underneath the newspaper then gel and a little water over top of it. After that I would rub the newspaper and press it down then I took it off and a thin layer would stay in most spots. The bare spots looked cool but I stuck the newspaper down this way mainly because lack of time. In all the bare spots I added water color which gave it a really cool torn and old look. After the background was finished I pasted one of The Beatles album cover over top and replaced two of the members with Elvis and Marilyn buy pasting them over top. Then I went around the edges of the picture and added some more newspaper and water color. To the left of that page is another part of the collage which I haven't finished. My plan for the right side is to add some newspaper and water color to the left of the newspaper. 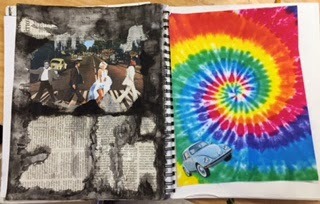 Then I will have the VW bug come out of the bottom right corner on top of the newspaper and water color shooting into the tie-dye. I really like how the left side turned out so I think the right will look great! I love this time period because of the music and lifestyle I have seen in it. My new records (one being a Beatles album) inspired this piece. I also love buggies because they are so cute (especially the old ones)! I did have some struggles with this piece though. The water color wasn't looking the way I wanted it to so I had to work with it for a while and the newspaper was hard to make stick with the method I used. Overall I really enjoyed learning how to make a meaningful collage.